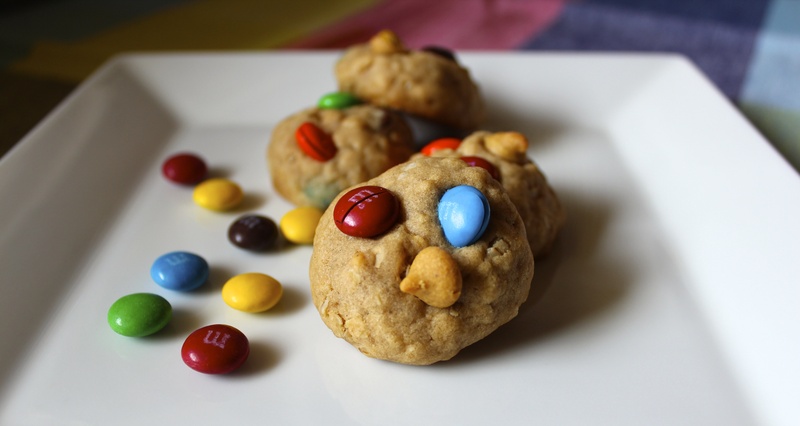 Happiness Project #29: Peanut Butter Oatmeal Surprise Cookies! Wow! What a crazy, beautiful, wondrous whirlwind these past 7 months have been. After two major surgeries, countless hospital stays and unexpected visits to the ER, there’s one thing I’ve found most prevalent: my baby girl makes it all worth it. With every little smile, every big giggle, every tiny reaching hand, this little girl is my everything. She is the meaning of everything good and heroic in this world. She is the meaning of love. My love. And even though being a new Mom means temporarily sacrificing some of my own favorite things, like baking and blogging, I wouldn’t have it any other way. She makes it all so very, very worth it. So to celebrate returning to the midnight land of baking and blogging, I’m thrilled to be posting this newish cookie recipe. Chocked full of all the yummy things a heart could most desire. You want Peanut Butter? Check! And Oatmeal? You got it! What about some Chocolate? Yes. Please. Then this, my friends, is the cookie for you! A cookie, that in all likelihood, may be the mother of all party cookies. Especially for all of the kids in your life (or those who are big kids at heart). Now some might say that having a cookie studded so liberally with chocolate chips, peanut butter chips AND chocolate M&M’s might be just a tad overkill. I, however, think not. This is one of THOSE cookies that will have everyone around you begging for more. Don’t believe me? See for yourself! Firstly & most importantly, preheat your oven to 350F. Line two baking sheets with parchment paper or Silpat baking mats. If you haven’t yet experienced the wonder of a Silpat baking mat, then get yourself over to your neighborhood baking supply store (Bed, Bath & Beyond, Sur La Table etc..) and get one! They are a bakers godsend! Trust me! In a large bowl, by hand or stand mixer, cream together the softened butter and both sugars until light & fluffy. Mix in the peanut butter, egg and vanilla extract until well mixed, scraping down the sides of the bowl as necessary (to prevent lumps from forming in the batter). Slowly add in the baking soda and flour, for a minute or two at your mixers lowest setting, until just incorporated. Using a wooden or plastic spatula, fold in the quick oats, M&M’s, chocolate chips and peanut butter chips. Roll the dough, either by hand or cookie scoop, into 2 to 3 inch balls and line them up on each cookie sheet. Pop them into the oven and bake for 9-10 minutes: around 9 minutes for a softer cookie or 10 minutes for a slightly firmer cookie. I like a little bit of both so I tend to bake mine for 9-1/2 minutes. Happy Baking, my friends! Hopefully, I’ll be back very soon with another stealthy recipe to share! « Happiness Project Recipe #27: Mini Chocolate Chip Cookie Cheesecake Cups!